Please read the disclaimer (below) before you begin. In this service, a portion of the links may have been used without the author's permission. Please let us know if you have linked to something and you would like it removed. While information is the cornerstone of our ability to provide superior service, our most important asset is our customers' trust. Keeping customer information secure, and using it only as our customers would want us to, is a top priority for all of us at Carolina Outfitters. 9. We will attempt to keep customer files complete, up to date, and accurate. We will tell our customers how and where to conveniently access their account information (except when we're prohibited to do so by law) and how to notify us about errors which we will promptly correct. "Carolina Outfitters makes no warranties of any kind, whether expressed or implied, as to the accuracy, reliability, or completeness of information provided. Carolina Outfitters will not be liable for improper or incorrect use of the information or for any damage suffered from direct or indirect use of its services. The information contained in these pages is dynamic and may change from day to day. "Carolina Outfitters (including its employees and agents) assumes no responsibility for consequences resulting from the use of the information herein, [or from use of the information obtained at linked Internet addresses,] or in any respect for the content of such information, including (but not limited to) errors or omissions, the accuracy or reasonableness of factual or scientific assumptions, studies or conclusions, the defamatory nature of statements, ownership of copyright or other intellectual property rights, and the violation of property, privacy, or personal rights of others. Carolina Outfitters is not responsible for, and expressly disclaims all liability for, damages of any kind arising out of use, reference to, or reliance on such information. No guarantees or warranties, including (but not limited to) any express or implied warranties of merchantability or fitness for a particular use or purpose, are made by Carolina Outfitters with respect to such information." "At certain places on this Carolina Outfitters Internet Site, live 'links' to other Internet addresses can be accessed. Such external Internet addresses contain information created, published, maintained, or otherwise posted by individuals, institutions, or organizations independent of Carolina Outfitters . As such, Carolina Outfitters , does not endorse, approve, certify, or control these external Internet addresses and does not guarantee the accuracy, completeness, efficiency, timeliness, or correct sequencing of information located at such addresses. Use of any information obtained from such addresses is voluntary, and reliance on it should only be undertaken after an independent review of its accuracy, completeness, efficiency and timeliness. Reference herein to any specific commercial product, process, or service by trade name, trademark, service mark, manufacturer, or otherwise does not constitute or imply endorsement, recommendation, or favoring by Carolina Outfitters ." "All Contents Copyright © 2009 Carolina Outfitters . All rights reserved." "The contents of all material and HTML coding available on this Internet Site are copyrighted by Carolina Outfitters unless otherwise indicated. Copyright is not claimed as to any part of an original work prepared by a U.S. or state government officer or employee as part of that person's official duties. All rights are reserved by Carolina Outfitters and content may not be printed, reproduced, downloaded, disseminated, published, or transferred in any form or by any means, except with the prior written permission of Carolina Outfitters , or as indicated below. Individuals may download pages or other content for their own private use, consistent with the mission and purpose of Carolina Outfitters [as certified in its governing documents] on a single computer. However, no part of such content may otherwise or subsequently be printed, reproduced, downloaded, disseminated, published, or transferred, in any form or by any means, except with the prior written permission of, and with express attribution to, Carolina Outfitters .. Copyright infringement is a violation of federal law subject to criminal and civil penalties. " Carolina Outfitters email forms ("Drop us a line," "sales information form" and "join our newsletter") requires users to give us contact information (like their name and email address). We use the information from the forms to send the user information about our company via email or postal mail. Only the email address is collected from the "join our newsletter" form. This is an opt-in list that our visitors may use to hear about Carolina Outfitters news. Users may opt-out of receiving future mailings; see the choice/opt-out section below. None of this information is made public is not sold to a third party. 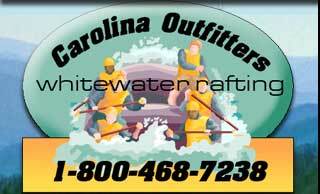 Carolina Outfitters contains links to other sites. www.nanthalarafts.com is not responsible for the privacy practices or the content of such Web sites. Carolina Outfitters has security measures in place to protect the loss, misuse and alteration of the information under our control. Transactions of products or services performed by our clients are done on a SSL secure server with 128 bit (high) encryption. Credit card information encrypted to prevent data from being stolen. Transaction information is given directly to the seller. The document and any information you send back are encrypted for privacy while in transit. No credit card information is held on any computer after a credit card transaction. Credit card fraud is a felony and Carolina Outfitters and it's clients will aggressively prosecute any one attempting to misuse a credit card number. Carolina Outfitters and it's clients track every transaction and will use all means available to it to prosecute persons attempting fraud. Carolina Outfitters provides users the opportunity to opt-out of receiving communications from us and our partners. Carolina Outfitters gives users the following options for removing their information from our database to not receive future communications or to no longer receive our ads or newsletter. Carolina Outfitters gives users the following options for changing and modifying information previously provided.